Wow! What a day January the 3rd was in Charleston, South Carolina. The low-country saw it's 3rd highest snowfall in recorded history thanks to winter storm Grayson. A whopping 6"! It was total madness! Total madness in a good way! The last significant snow storm was in 1989, ironically the same year as Hurricane Hugo. Since we don't get snow in Charleston, we lack the proper gear available to clear the roads: salt, plows, snow tires, etc. We also have bridges everywhere that are very good at freezing. And we are all knuckleheads wth no clue on how to drive in winter conditions. As a result, everything was closed: schools, offices, the airport...everything. Even Starbucks! WTF! The combination of the snow and folks being off from work resulted in pure hedonism. Yes, this is what it seems. 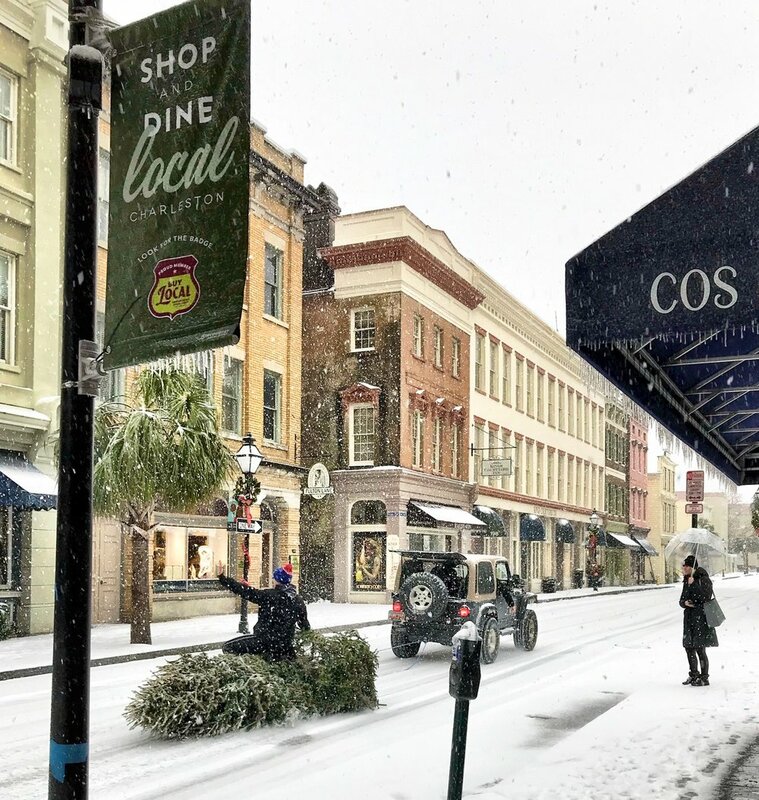 A man riding a Christmas Tree Chariot down King Street with the aid of a Jeep Wrangler. Everyone I saw had smiles on their faces. People were out and about running around, frolicking, throwing snow balls, cross-country skiing on King Street, using boogie boards as sleds, riding Christmas trees, making snow angels and drinking large amounts of alcohol. My first reaction was to get out and see the peninsula and take as many photos as I could. Who knows when we will see something like this again. It was amazing to see your environment completely change. Since people stayed off of the roads (for the most part), the snow in the street remained a nice clean powder, and the streets were transformed into public spaces. On my street, it was impossible to decipher the sidewalk from the roads. Oh yeah...did I mention that we have our first little one on the way? As I look out the windows from my office I see icicles hanging from the eave. It makes me smile. I hope you had a wonderful day yesterday and why let the fun stop there. Get out there hit the slopes!